Ignacia Ossul and Jack Davy took on the role of ‘Navigators’ during the two-week Global Citizenship Programme. The position supported undergraduates’ learning whilst building upon their own teaching experience. The Global Citizenship Programme is a two week programme for UCL undergraduates and taught postgraduates offering the chance to put their studies in a global context, learn new skills and see the world differently. 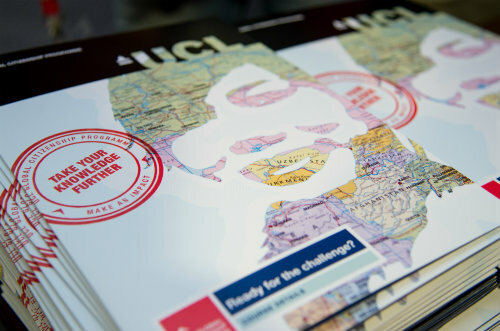 Courses for first and second year undergraduates focus on the UCL Grand Challenges – enabling students to tackle the same key global questions as UCL’s world-leading researchers. The courses are specially designed to be multidisciplinary, accessible and enjoyable and students study in small groups of 12-15 participants, each led by, usually, a PhD student (their ‘Navigator’). While some content is delivered by lectures, the focus is on the project work these groups produce together. Ignacia Ossul (UCL Bartlett Development Planning Unit) and Jack Davy (UCL Anthropology) supported students on the ‘Sustainable Cities’ and ‘People and the Sea’ strands respectively. What was your role as ‘Navigator’? Ignacia (IO): My role was to help facilitate the students’ learning by assisting them on all their group projects. I was also able to answer any questions they had outside of the lectures or talks. At the end of each day, all the Navigators would meet to discuss the day’s teaching, their approaches and what worked and what didn’t work. Jack: (JD): The students were set tasks and objectives throughout the two weeks and my role was to help them complete each of them by navigating them through the process and encouraging critical thinking as well as team work. I was also able to supplement the teaching from the days’ talks by clarifying any of the content or themes. How, and why, did you get involved? IO: Although I wasn’t formally involved in the set up of the strand, I knew about the Programme from an early stage – the Bartlett DPU has a global focus which matches closely with the aims of the Global Citizenship Programme so it made sense to share some of the issues the department explored with undergraduates. Also, as the department currently only has Master’s programmes, it was an ideal way of gaining undergraduate teaching experience. JD: I wanted to apply some of my academic and previous teaching experience to a different context. Also, as an anthropology student I can see the value of students exploring global citizenship themes so it was also a rare opportunity to help teach a diverse group of undergraduates complex subject matter. How did you address students’ queries on Global Citizenship? IO: As the students came from all disciplines and backgrounds, we had to be quite flexible in our approach to responding to queries. Our knowledge of the subject matter meant we were able to guide them through the process of achieving their objectives and through this they were hopefully exposed to new ways of thinking and new ideas of concepts such as ‘global’ and ‘ethics’. The case studies especially were a way of looking at how issues are handled differently around the world. JD: I hadn't looked at global citizenship in depth before the course, but as Anthropology is interdisciplinary many of the issues explored have a global awareness element. The students really engaged with the topics and themes through presentations and roleplaying elements – I could see how over the course of two weeks students were thinking critically about what global citizenship means. What surprised you most about the students? IO: The quality of presentations from all the students was excellent; they really understood the objectives and themes. JD: How enthusiastic they were – you could see how they appreciated learning new skills and enhancing their career prospects but also how they enjoyed getting involved with the interactive parts of the programme. The end of the two weeks culminated in a UN conference and there was lots of enthusiastic participation. How did the role help you to build teaching experience? JD: It was my first formal teaching opportunity and provided a great introduction as it was an intense two weeks with a diverse group of students. It meant I had to be flexible about teaching methods and as there was no formal assessment output the pressure was slightly off. The skills sessions beforehand was useful in providing an idea how to do things but trial and error proved the best way to learn. Would you recommend the role to other PhD students? IO: Definitely. It was great to help students learn how to think critically and ethically about global citizenship. JD: It was good to know what’s happening in other parts of UCL and to see how courses overlap through the themes of global citizenship. I think this would be useful to anyone studying and teaching in higher education.